Imado Shrine (今戸神社, imadojinja) is the Japanese shrine located in Imado where north part of Tokyo Asakusa. It is one of the Shichifukujin(七福神) Shines of Asakusa, and enshrined Joeroku(福禄寿). The history of the shrine begins at 1063 by Yoshitomo Minamoto and Yoshiie Minamoto. It is very famous for the birth place of fortune cat (招き猫, manekineko), and last place of Soji Okita(沖田総司), the greatest samurai warrior of Shinsengumi(新撰組). Now, it is well known as good luck shrine for love and marriage. There are many good luck items for love and marriage with fortune cat. Small but interesting and historically important place. Many interesting fortune cats you can buy. 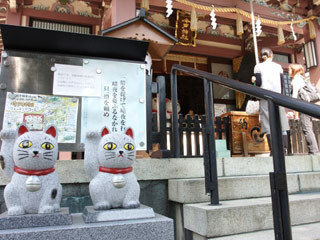 Visit Imado Shrine for checking out the birth place of the fortune cats. The fortune cats is one of the most loved good luck items for Japanese. Especially, in this shrine, the fortune cats brings great luck for love and marriage. If you are looking for your bride, this is the best place to pray your fortune. There are many fortune cats items in this shrine and around there. All of them are unique and cute. Those fortune cats are made by Imado ware which is also one of the traditional earthenware of Japan started there in Imado. Imado ware made in what is now called Imado in Taito city, was one of the most popular type of earthernware fo vessels and figures during the Edo period. The Pedestals of the guardian dogs at the Imado Shrine, carry the names of Imado potters and the date of 1752 when these figures were presented. Imado ware was said to have originated at the beginning of the Edo period, however it was not until the endo of the 18th Century that it was given the name of Imado ware. As a result, it can be presumed that Imado ware was already being produced full scale during the first half of the 18th Century. THe production of old fashioned roof tiles flourished along the banks of Sumida River. This production of Imado ware was depicted in "Edo Meisyo Zue" and in "Sumidagawa Choryu Zukan" currently being held at The British Museum. In recent years, excavations at the ruins of Edo have uncovered earthenware vessels and dolls carrying names of potters of Imado ware and also roof tiles with the impressed seal of Imado. The Great Kanto Earthquake and WWII Tokyo air raids forced almost all potters to move out of Taito city, leaving only one family, which still produces earthenware dolls of traditional figures. These include "maneki neko" know as fortune cats and "Kuchi ire kitsune" know as good life foxes. This shrine is also known as the last place of Soji Okita who is one of the most popular and strongest Sumurai in the Edo period. He was the team leader of 1st party of Shinsengumi. When he was suffering from tuberculosis, he curing at this temple. However, he died because of that. It was great irony that the greatest sumurai who never lost by sword fighting could never get over with his disease. Fukurokuju is the one of the enshrined god in this shrine. Fukurokuju is one of the Seven Lucky God in Japan. When you are in Asakusa, visit all Seven shrines and temple where enshrined each gods. This god brings you the happiness and long life. Enshrined God: Emperor Ojin, Izanaginomikoto, Izanaminomikoto and Fukurokuju. Pray for: Good luck for love and marriage.